"My fire service career now almost spans a half a century. I have lost track of the tens of thousands of firefighters that I have had a chance to make acquaintance with. I can’t remember half of the fire chiefs that I had worked on projects with. 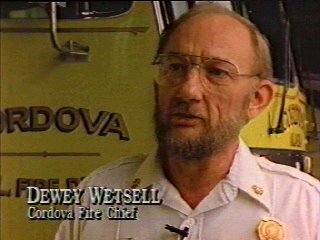 Yet, when the name Dewey Whetsell is mentioned in a conversation I have this instant image and total recall of my exposure to him. Dewey Whetsell is not only unforgettable but inimitable. "When he gave me a copy of this book to review I was looking forward to it for the simple reason that I expected it to be unusual. When I sat it down, I was even more fascinated by what it did to reinforce my perception about the man and his life. Dewey is not only the kind of person who tells you the way things are; but he also tells you the way it ought to be. "I will never forget my first opportunity to meet Dewey at a training conference in Anchorage Alaska some twenty years ago. Coming up from the Lower 48 I had an impression in my own mind of who I was going to be talking to and what I was going to talk to him about. In a five minute conversation with Dewey, I was disabused from any idea that I was dealing with the back woods – instead I was confronted with a combination of real people who possessed almost renaissance like skills. "Therefore, it was a pleasure and a unique honor to be able to write a forward of this book. If you complete this book without having an understanding of the passion, the commitment and the competency of this man and his peers in the great State of Alaska, I would be moderately surprised." Currently, Ronny J. Coleman is Senior Vice President Emergency Services Consulting Inc.